I just used some fine sandpaper and deburred mine and then used a bit of black nail polish from my wife's collection. It smoothed in pretty well and even filled in a rather deep gouge. At first I was going to call to return it, but then I decided to just fix it and keep it because I was starting to feel like I was pestering them since I already had to contact them a few times as I noticed first that my drag chain did not come in my box, and then that I had the wrong delrin nut and was missing a set screw, and then as I was nearing completion I found I was missing a few more M5x10 screws to attach the X-carve to the wasteboard rails (I discovered later that I wasn't mising the M5x10's but that the directions for the 1000mm version called for M5x10's, but actually was suppose to use M5x8's (which I did have). The directions have since been fixed. Yah, I just used a black sharpie on mine, the little nicks don't bother me...it's a tool, not fine china. 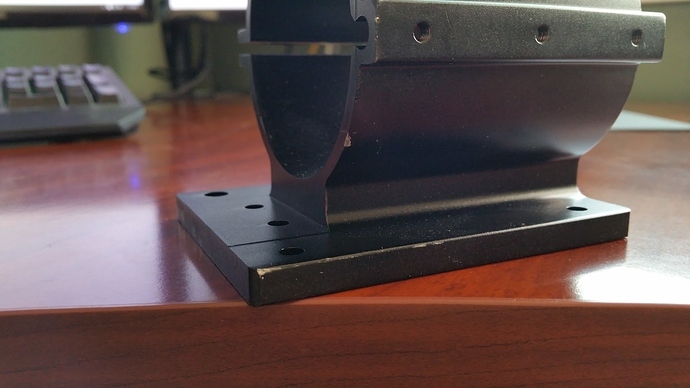 I was just surprised after the stock spindle mount was so pristine. Installed last night and was amazed at the capability of the Dewalt. 100 year old white oak cut like butter! Anyone played around with the speed settings? 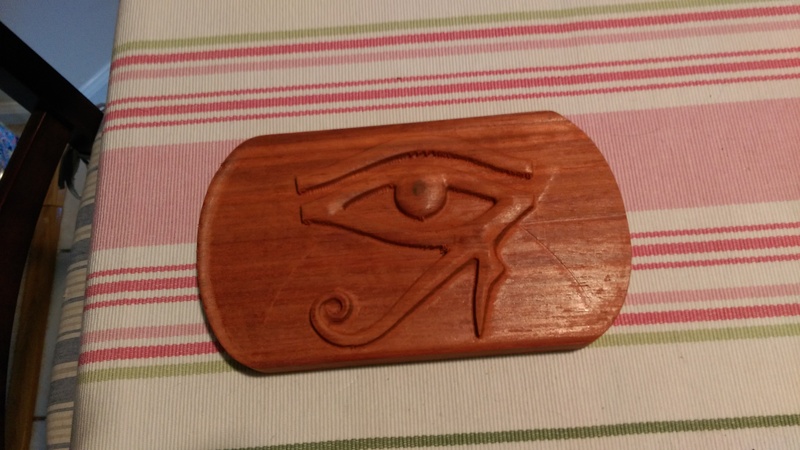 I did a relief cut in African Padauk (nice hard wood) using a 1/8" ballnose bit. I cut at 50 ipm, plunge of 30 ipm, the depth was up to 1/4" and it had no issues. If you mean speed dial on it, it's not making any difference. Slowest speed is lot faster than stock DC spindle anyway. I adjust it 3 for reasonable noise level. I think best way to use it between 2 to 4, depends on bit size. I only used speed 2 for waste board surface cleaning with 3/4" flat. So far I am seeing some vast improvement over the stock spindle. I have been trying to make progress on V-Carving for the last month or so and each attempt was ending in frustration. 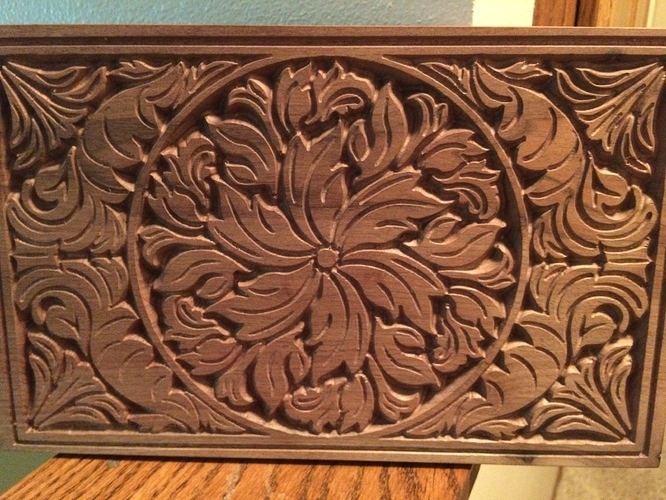 Sunday I ran the code (from V-Carve Pro Trial) for their v-carved box lid and it came out great in both MDF and Walnut using the stock setting of 100 in/min feed and 30 in/min plunge. It is temping me to buy V-Carve Pro seeing that the machine is reacting much better with the increased horsepower. Wow, 100 in/min feed! I was running 40 on the stock spindle, thats more than double! 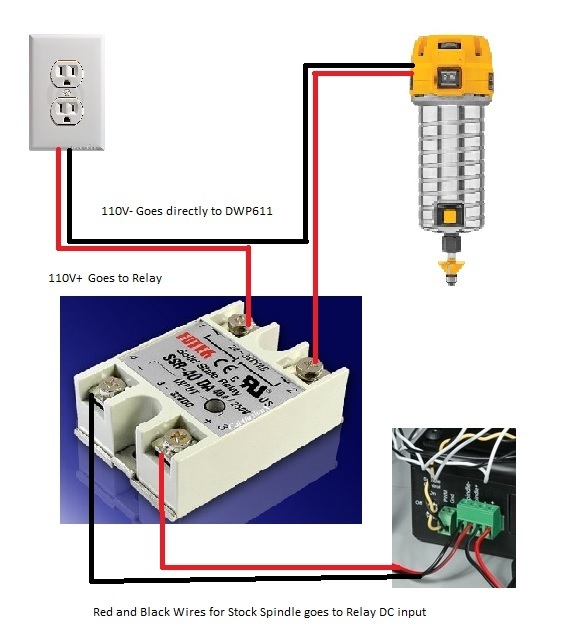 Im exited now, but havent connected the Dewalt up yet, Im waiting for my relay to come in so I do the change over all at once!! What is he depth of cut? On the stock spindle I was at about .03 in, 40% overlap! This is full depth V-Carving so there isn't really a defined depth per pass. The deepest portions are around 1/4"-3/8". The optimization of the tool pathing I think plays a big part in the success when V-Carving. It was pretty fun to watch the machine make those sweeping paths down to full depth with no chatter. These carved in around 15-20 minutes each. 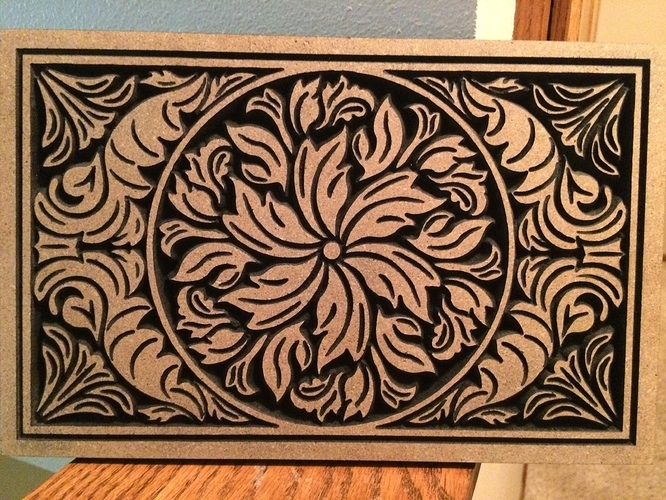 I did go ahead and order a copy of V-Carve Pro so that I can start doing more of this type of work with custom designs. BlairHarp - where do you get your artwork? Or did you create that? Can you post the "*.crv" file? It's awesome! When you get V-Carve Pro experiment with the 3D carving. That is amazing to watch and all you need is a ball nose bit. Also, the tutorials on their site are great - I always learn something and find it interesting that the guy sounds like John Oliver but uses inches instead of metric. It is the lid of this box. It is one of the sample projects it will let you generate gcode for in the trial version. Nice job, as I'm not great at electrical any chance of posting a wiring diagram? Also where did you purchase your relay and project box? 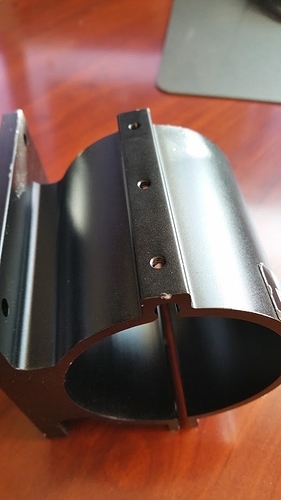 ordered a 611 router, inventables mount and a 1/8 collet adapter today. Is this one a good? That's what you need. Go ahead and order it, I'll draw wiring diagram for it. Project box from Fry's electronics, you just need 110V in and out plug sockets attached to it. Great! Did you use a heat sink for the relay? I was thinking to do that, but it's not heating. As you can see, I left open window for enough ventilation. Don't have any problems yet. When I start carving, Dewalt is working about 2 hours at a time with no problems. I try to make it clear, Hope it helps.